Back from a week in studio, recording Reidar Larsens new album. I've cowritten 4 songs for the album, with Ingvar Hovland, Gunnar Roalkvam doing the lyrics. The basic tracks are finnished so now we have to add some horns , background vocals, percussion. Our buddy Norton Buffalo (norton-buffalo.com) will add harp . This will be Reidars 10. studio album and his first in Norwegian. 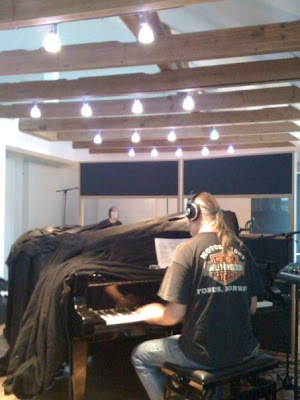 Its recorded in the studio Pettersens kolonial in Hønefoss, a new studio with great rooms, Bechstein piano, a 59 Hammond b3 , protools and a great sounding SSL board.